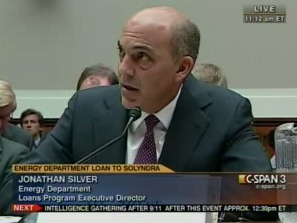 Jonathan Silver of the Department of Energy says he has no reason for the FBI raid of Solyndra. Silver, who is the loans program director at the Energy Department, says there is "no reason" to "believe we were misled" about Solyndra's financials. Del. Donna Christensen (D-Virgin Islands): "Did Solyndra ever mislead the D.O.E that you know of? Do you have any reason to think the company was not providing you with all appropriate information? Jonathan Silver, Department of Energy: "We have no reason sitting here today to believe we were misled." Coulter On Gardasil: Perry Makes Us Ask "Who Is This Guy?"